Its April and its seven months since we collected our new caravan. One of the few niggles I have with the caravan is its terrible Jockey wheel. 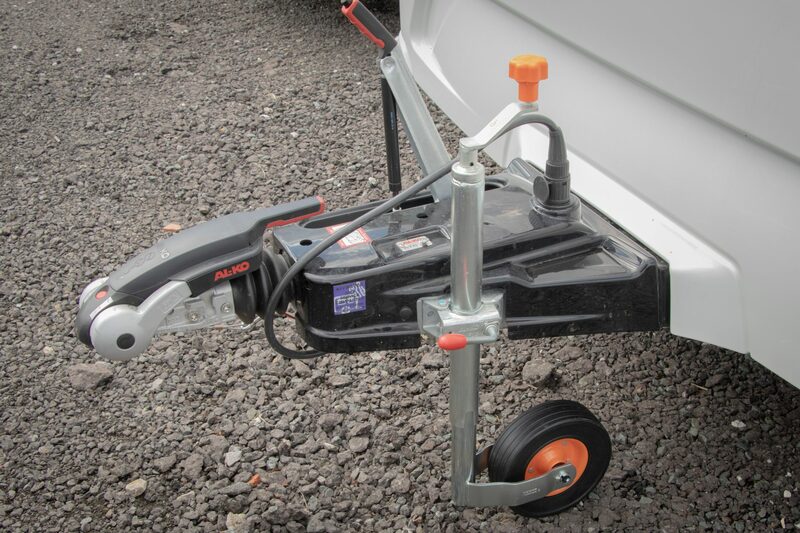 The jockey wheel is a standard ALKO type made of a hard plastic and this became an issue when we manoeuvred the caravan at a recent trip away at Lincoln Farm Park. The wheel would not turn when we moved the caravan with the motor mover, and just kept digging into the pitch. This meant I had to keep lifting the front of the caravan onto the soft gravel that was in front of the caravan, while Angela shuffled her feet to reposition the gravel and remove the “groove” that our caravan had created. It wasn’t just on camp sites that we were having an issue, we were having the exact same issue at our storage yard, when we move the caravan back into its “snug” home. 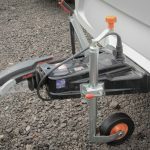 I had been contemplating changing the jockey wheel sooner rather than later, so it was perfect timing when Kartt got in touch regarding a review of “The Ultimate caravan Jockey wheel”. So, what makes this so special? Other key features include the “Turn-Lok” system that prevents the jockey wheel unwinding during travel. This means no additional clips, tie backs or fixings are required. Of course nothing replaces simply checking that the jockey wheel is tight before departure, but I’m all for safety items to mitigate any risks. 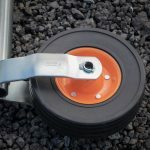 The wheel hub is bright orange, It does stand out, and although I’m not a fan of the colour it certainly looks a lot smarter than the old one and being powder coated it should last. The new Kartt jockey wheel also has a nylon bearing that I’m almost certain our old one didn’t. the new wheel spins freely whereas the old one just doesn’t move without some encouragement. Incidentally, the old jockey wheel was just 7 months old. When I replaced the wheel, I looked closely and found a crack in the plastic moulding. In its entire life I would imaging its travelled no more that 20meters on the floor, so if you do have jockey wheel issues – do check it is okay and spinning freely. Anyway, back to the review.The construction of the new Jockey wheel is pretty substantial, this is indicated by its increase in weight and chunky design. This one weighs in at just under 6Kg, and the Alko counterpart is around the 5Kg mark. All the metal surfaces are a bright plated steel that looks far neater, but maybe that’s because it is new. Swapping the jockey wheel over is quite simple. I created a video on how to replace a jockey wheel, have a look here on hints and tips on doing this yourself. How have I found it so far? After the swap over I took the caravan for a trip out of its bay in the storage yard, left and right then back into its home. The jockey wheel was far better than its predecessor. Not only was it quieter, it moved freely and changed direction when I swung the caravan around. One thing I noticed was how the jockey wheel would ride on the stones. The original jockey wheel would almost fall off large stones and eventually bog down pushing the stones behind the wheel – causing that trade mark grove. With the Kartt, this didn’t happen. It would get deflected from large stones or lumps and bumps, but then it wouldn’t bog down, instead the wheel kept turning and no grove. It seems Angela’s shuffling days are numbered! This jockey wheel is a better construction, better quality than the one that came off. 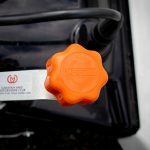 I really like the Turn-Lok system, it’s reassuring to know that if I forget to check the jockey wheel there is a system in place to minimise the chance of it becoming loose. I’m not too keen on the colour however, It doesn’t fit in with the caravan, instead it stands out like a sore thumb – but perhaps this will grow on me over time. A huge thank you to Kartt for sending this product for review, Let me know your thoughts in the comments below. Funnily enough, I have been looking at and considering this jockey wheel Dan for the same reasons you quote. Imagine the App I one with the Buccaneer’s nose weight! Not coloured just galvanised? steel and a 90 degree handle from the horizontal so more leverage. It is also a lot cheaper for us budget conscious ‘vanners! Bought one and think it’s far better than the original on our 3 year old bailey unicorn.